E L I M I N A T E D ? It is said that the spirit of Mumbai, remains indomitable even after the terrible bomb blasts of 1993 which killed 250 and injured another 700; then 2003, another 50 dead and 150 injured and again now in 2006 with the body count crossing 200, leaving dismembered bodies scattered on the railway tracks; Mumbaikars never get cowed down; not only Mumbaikars but all citizens of India end up patting themselves on their backs – we are brave; terrorism cannot get the better of us and so on and so forth. But what about the dead or dying, as a result of such acts of terror and violence; what about their families and near and dear ones? Can the compensation of a few thousand rupees be a substitute for a lost child or parent? Is it courage or callousness that makes us immune to such tragedies? Is it bravery or helplessness? CAN TERRORISM EVER BE ELIMINATED? BY WHEN? HOW? By violence! counter terrorism! or by GANDHIGIRI, the new buzz word? I came across an article in ‘The Search for Truth’ by Tikam Matai – an appeal to the Heads of State of all Muslim Countries, which although made in 1987, has equal significance and relevance even to-day. It appears in this issue of your magazine and is really worth a read. 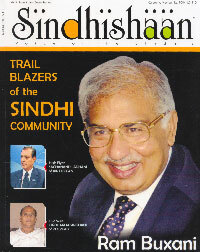 In this issue, we also carry articles and profiles of Sindhi businessmen and families whose achievements, besides being a showcase for the world business community, are a source of joy and pride for the entire Sindhi Community. Meanwhile the festive season is with us again; I sometimes feel time has been put on the fast forward mode. And with this begin shopping sprees, card sessions and all the revelry that goes with it. Sindhishaan wishes its readers a Happy & Prosperous Festive Season.